Bed bugs are annoying little flat bugs that feed on human blood and can infect entire buildings if not treated properly. These vexatious bugs are a serious problem for senior citizens and the caregivers that care for them. Their bites itch and get infected, they hitchhike on clothing, and they leave a mess everywhere they go! 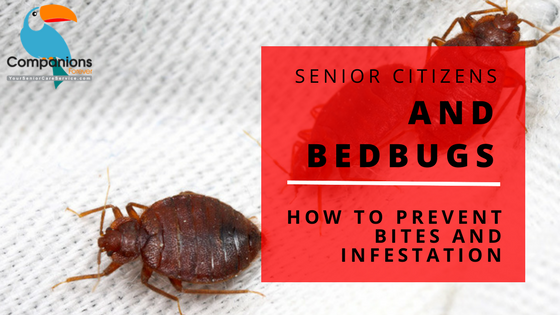 Bed bug infestations are common all over the world but the issue is more problematic for seniors who may not see or feel them. It is important for the adult children and caregivers of the elderly to look out for signs and symptoms of bed bug infestation. Companions Forever can help you find the signs of bed bug infestation and learn more about treatment before it spreads. For Senior citizens, bed bugs can be a serious problem if ignored. Seniors may not see or feel them due to poor eyesight and physical challenges. When infestations or signs of bed bugs aren’t taken seriously, it can affect seniors in a multitude of ways. Not only do bed bugs leave irritating bites, they also leave excrement and shells throughout the home. Bed bugs are hitchhikers and leave a trail of where they’ve been. Sometimes an older person cannot recognize if they have new marks or bites on their bodies due to their age and medical ailments they may have. If their loved ones or senior caregiver does not recognize the signs of bed bug infestation, it can lead to hospitalization and emotional harm. It is important to treat bed bug infestation as soon as possible. Bed bugs are tiny sneaky insects that like to hitchhike to people’s homes, crawling into the cracks in the walls and getting into mattresses. If you suspect bed bugs have been on any clothing or bedding you can throw these items into the dryer which will kill any bed bugs due to the high temperature. Preventing a bed bug infestation is about being vigilant and preventing any opportunity for bed bugs to show up. Being on the lookout when changing bed linens is one of the simplest things that can be done to prevent bed bugs from showing up. Red welts, itching, burning, and localized rashes are symptoms of bed bug bites. They can be hard to discern from other common bugs such as mosquitos and spiders. Looking out for signs that bed bugs have been on clothing, bedding, and on walls can help figure out if bites are from bed bugs or other insects. According to the American Academy of Dermatology, it is impertinent to visit a Physician or Dermatologist if one has a severe reaction to bed bugs. Mild soap and warm water also relieve the burning and itching symptoms from bites. Most cases of bedbug bites are mild and people recover after a couple of weeks. Ignoring an infestation of bed bugs is not a good idea. These insects spread fast and can take over a whole house! Addressing the problem head on is the best thing to do for Seniors who have been bitten by bed bugs. Caregivers of senior citizens are the first to notice signs of bed bug infestation and at Companions Forever. Our experienced caregivers are quick to notify us of possible bed bug infestations. Client Relations are here around the clock to address issues such as this. We can help remedy the situation to ensure that seniors are living stress-free. Want to learn more about senior living?